Here is another super easy dinner idea with endless possibilities for variation. 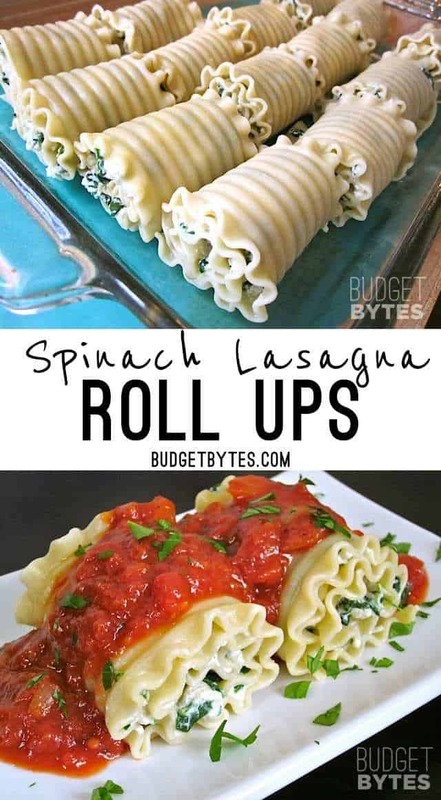 I can’t exactly say that Spinach Lasagna Roll Ups are a “quick” recipe because it does have to bake a while but the actual assembly is really quick and easy. 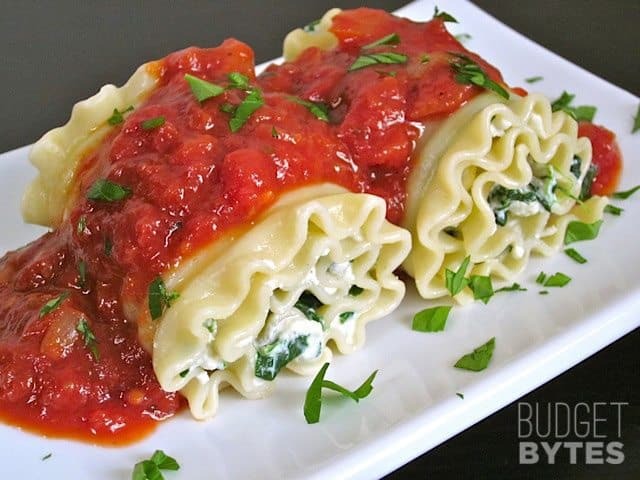 I filled my Lasagna Roll Ups with spinach and cheese but you could also do mushrooms, pesto, or any meat. You really can make this one your own. Combine the roll ups with a classic salad and some quick garlic bread and you’ve got a stellar meal that has “date night” written all over it. If you don’t have a date, simply pop them into individual containers and freeze. When you’re ready for a serving just take one out and microwave until it’s cooked through. Take that, Marie Callender! Easier than lasagna, but every bit as delicious! 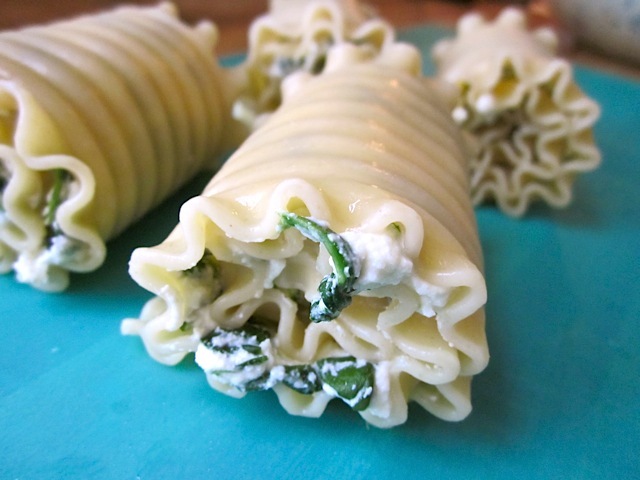 These Spinach Lasagna Roll Ups are a freezer friendly family pleaser. Get a large pot of water boiling with a dash of salt. When it comes to a full boil, add the lasagna noodles and cook until al dente (soft but not soggy… about 12-15 minutes). When they are finished cooking, drain in a colander. While the noodles are boiling, prepare the filling. Thaw the package of frozen spinach in the microwave and then squeeze out as much excess liquid as possible. Combine the spinach in a bowl with the ricotta, mozzarella, parmesan, egg, freshly grated pepper and about 1/4 tsp of salt. Mix until well combined. Begin boiling water for the noodles. 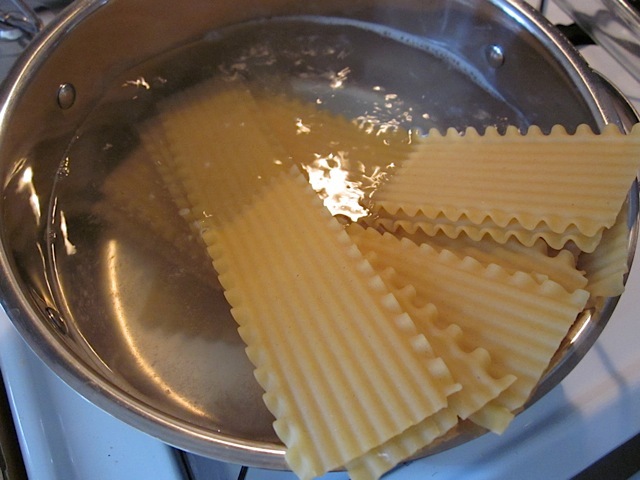 While you’re waiting for the water to boil, prepare the lasagna filling. Thaw and squeeze dry the spinach. I literally take the whole clump in both hands (clean hands!) and squeeze the living day lights out of it. 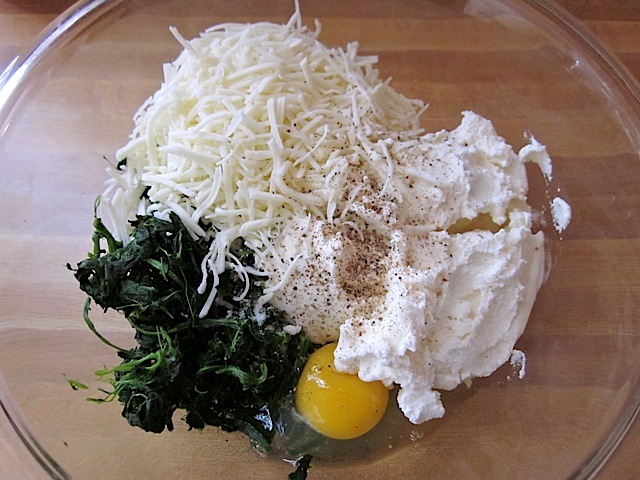 Combine the “dry” spinach ina bowl with the egg, ricotta, mozzarella, parmesan, salt and pepper. Mix it all up until it’s evenly combined. By this time the water is probably ready for the noodles (heavy boil). Add the noodles boil until soft but not mushy. Occasionally stir the noodles while they cook to prevent them from sticking to each other and the pot. Stir gently because torn noodles = not usable. Once your noodles are cooked, drained and cool enough to handle, lay a few out on a clean surface. 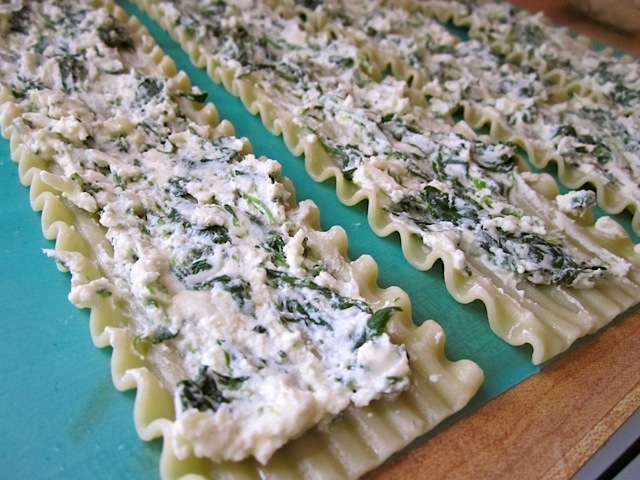 Spread a few tablespoons of filling over each noodle. The filling doesn’t have to be that thick because once they’re rolled up, it will be compounded and seem thicker. 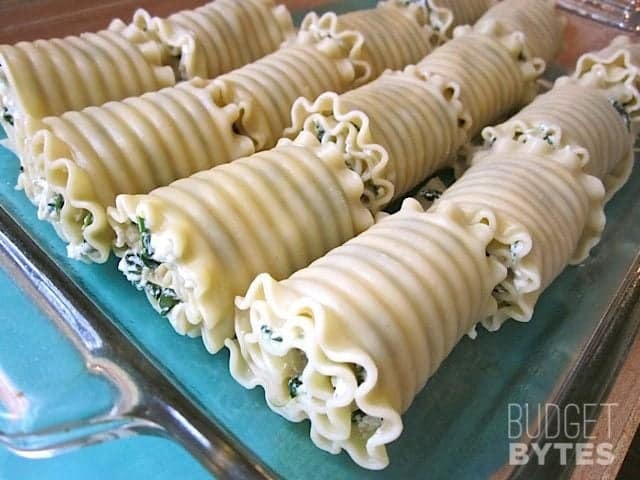 Place the rolled up noodles in a baking dish coated in non-stick spray. I was able to get 14 roll ups from that amount of filling. 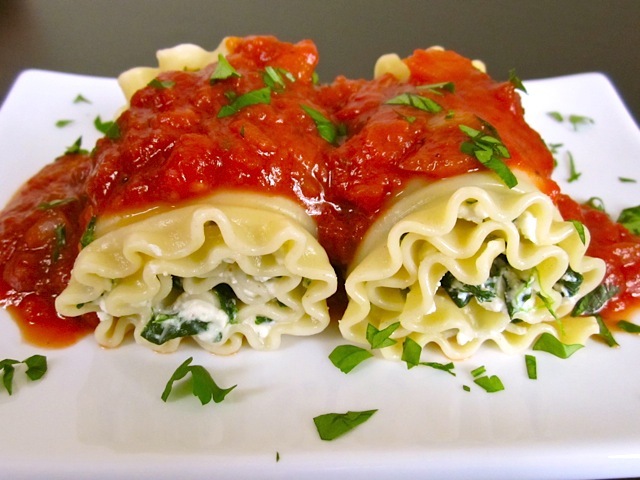 The number of roll ups you get will depend on how thickly the filling is spread on the noodles. 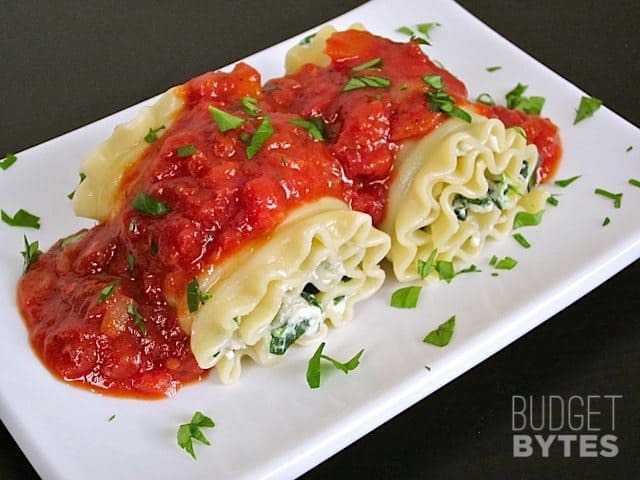 Cover the lasagna roll ups in marinara sauce, taking care to fully cover the noodles (this keeps them hydrated and soft). Cover the dish with aluminum foil (again to prevent drying during baking) and bake for 30 minutes at 400 degrees. I really enjoyed reading your recipe, it was explained clearly. The photos made it even clearer. Because of this I really wanted to try to make it myself. I have already made the lasagna roll ups for my family, but I do have a small remark. Namely ricotta has a very special taste that not everyone can appreciate and you did not mention this in the recipe. 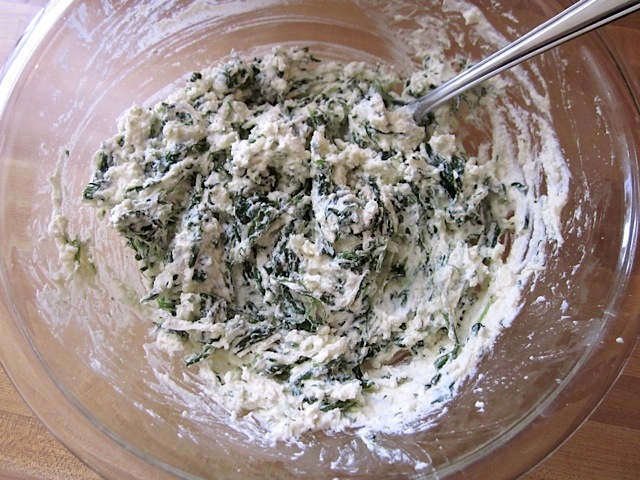 I like the taste of ricotta very much and therefore have I made it with the ricotta and spinach. My brother and dad doesn’t really like ricotta, so I replaced the ricotta with meat, as you suggested. That was of course delicious too. Let’s say that I am not really an experienced cook, but thanks to the clear explanation I managed without problems. 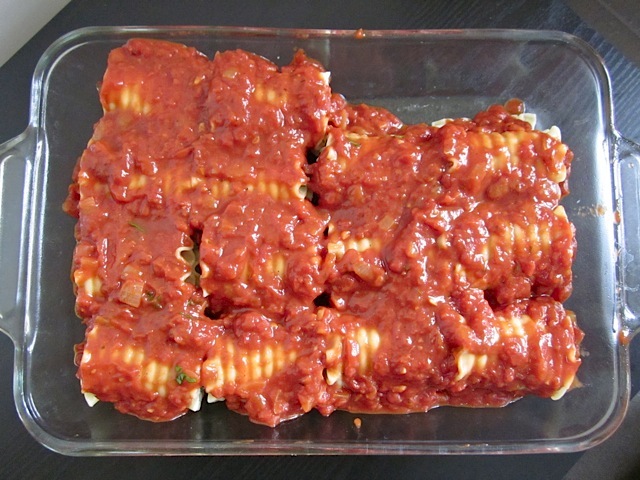 My family was very enthusiastic and I will definitely make this delicious lasagna roll ups again. This was so good my 15-month-old and 4-year-old devoured it in minutes. Thank you! Can you prep these and refrigerate for a day before cooking…or would I have to prepare and bake on same day??? Great recipe, thank you! I tripled the recipe which yielded 3 trays, 15 rolls in each for a total of 45 rolls! Delicious! I made these tonight and they were excellent. Thank you for the recipe. Also for next time, if I wanted to freeze them and have them in the freezer for my lazy cooking days when would I freeze it? Before baking? After baking? Isn’t there raw egg in the filling? Oh, oops. I thought I double checked the ingredient list to see if there was egg, but somehow I missed it! :P Thanks for catching that. Freeze after baking.